How to grow Cape gooseberries? 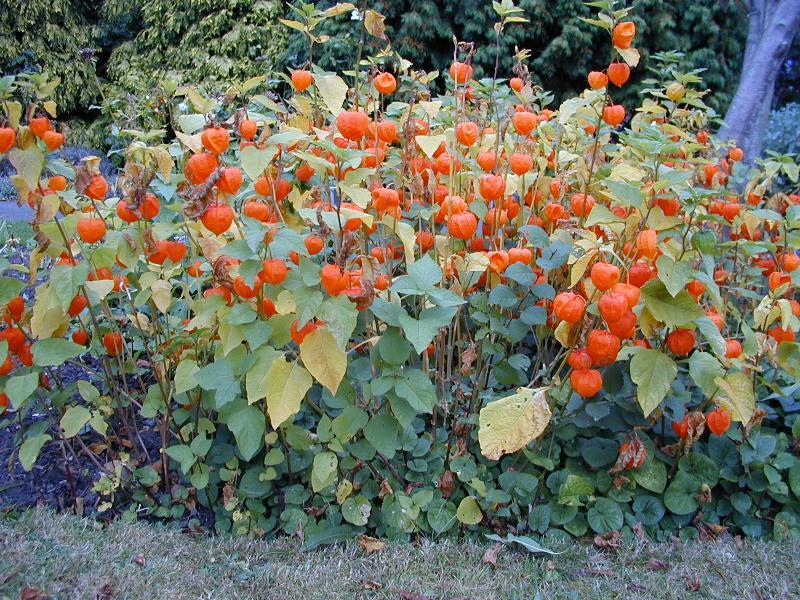 In the photo: bright lanterns of physalis in the garden. 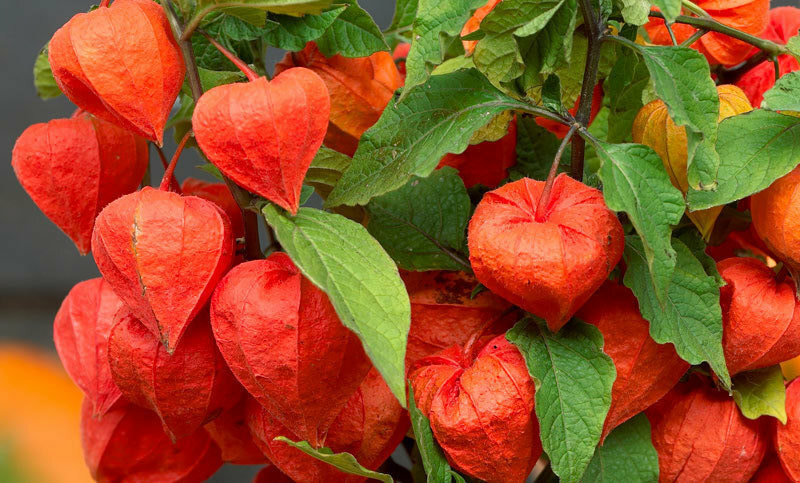 Everyone bright orange lanterns physalis – bright, a powerful feature on the site. The plant can be successfully used for design flower beds, edible fruit vegetable or fruit crops used in the menu, consumed fresh and canned. To grow shrub is easy, you just need to create the right conditions and to exercise at least minimal care. Finalise quickly adapt to different growing conditions, they can bear fruit and in the bright sun, in partial shade. But the most beautiful bushes growing still in the open and well-lit venues. The plant is not afraid of the winds and drafts. In people, the physalis is called "earthy cranberry" or "emerald. 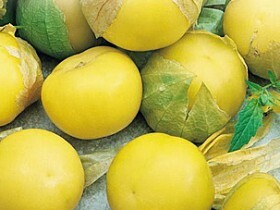 ", "the Peruvian gooseberry" or "Jewish Apple". Translation from Greek – "bubble". Homeland plants – South and Central America. The local population uses it, as a culture, a very long time, withdrawn a large number of beautiful and productive varieties, which are adapted for cultivation in the mountains and on the plains. Hence the "Mexican tomato" was brought to North America, but in the seventeenth century – in Asia and Europe. In Russia the plant is penetrated simultaneously with the tomatoes, but they are not widespread. The fruit can be painted in orange, yellow, purple or green, they resemble pearls, hidden in the folds of the shell. 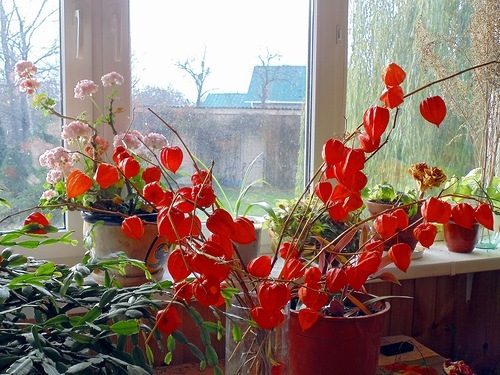 Chinese lanterns at the window. Fizalisa not tolerate soil even with a weak acidity. Before planting you must ensure, the soil is neutral or lime. Also absolutely contraindicated in the plots located close to the surface of the groundwater level, seals, zolotistogo, stagnation. Ideal: well-drained, fertile soil, loose and lightweight. Before carrying out the landing ground can be improved, Perekopa it to a depth 40 cm twice. After the first pereopisanie in the land is made of mineral and organic fertilizers, then the procedure is repeated. The second time it can be done with a pitchfork. The plant needs a fairly large space for growth, the bushes are fitted at a distance of two feet from each other and from other cultures. After planting the seedlings watered, soil mulching. Physalis is in need of rejuvenation. The bushes are inclined to rapid growth and spread to neighboring areas. Every five to seven years they are separated and transferred to new locations. 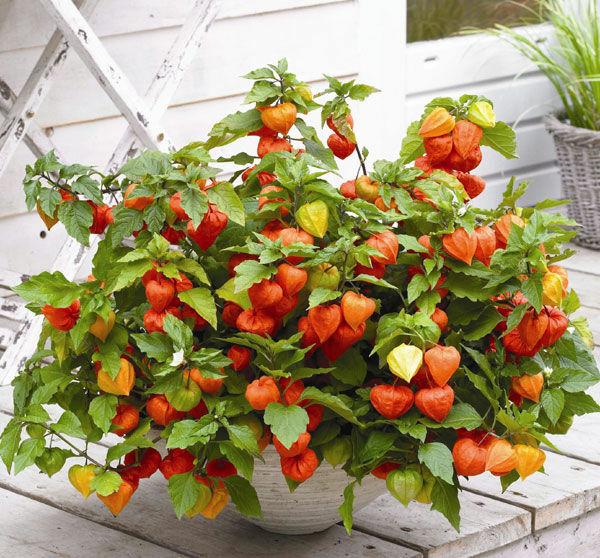 Decorative, physalis garden needs regular watering only during prolonged droughts. But vegetables require more attention and care. Desirable system watering through the day, in cloudy and humid weather – once a week. The first fertilizing is conducted in the initial stage after planting, during active development. Used humus, wood ash, compost, of complex fertilizer nitrophoska, superphosphate, ammonium nitrate and potassium salts. Components dissolved in water, is watering plants. The second top dressing of the same fertilizer shall be made during flowering. Third time bushes can be fed in August or September, phosphorus or potassium fertilizers. Fizalisa not like uninvited guests – weeds. Once in a month and a half spend weeding and soil loosening. The procedure can be performed less frequently, if you apply mulching. Culture does not need regulating, forming or rejuvenating pruning. In order, to increase the number of flower, enough to pinch off the tops of the branches. The procedure is done in June. Vegetable physalis Matures through 80 – 90 days after the sowing. Ripened fruits become characteristic color, "lanterns" lighter. Decorative twigs cut then, when bolls have not opened their own doors. Harvested in Sunny weather. Immature fruits are well stored in the fridge, they do not deteriorate and can survive until the spring. the separation of the bushes. All the ways are quite simple, but the most effective is the separation. The creeping roots of the physalis quickly adapt in a new place, they can easily tolerate a transplant. The procedure can be performed in the fall and spring, large, an adult Bush is divided into several, each should be a few healthy shoots and well developed root system beam. Cuttings carried out in July. For the purposes of reproduction fit the tops of the shoots with two or three buds. Rooting occurs in normal conditions under the hood. From the seeds of the plant to and through the stage of seedlings, and direct seeding in a permanent place. In the middle zone are limited to the may sowing, in other cases, the procedure can be carried out in the spring, and in the winter. The sowing for seedlings carried out in the middle or at the end of April, for each seed, use peat pots. Young sprouts once fed mineral fertilizers. At the end of may, disappears when the threat of frost, the seedlings are transferred into the open ground. 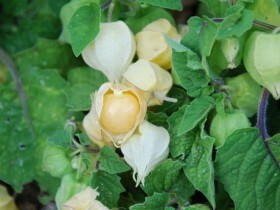 The period of adaptation, all species of physalis are often watered and pritenyayut. In the middle band for physalis don't need no protection in winter. If winter is snowless – bushes may be damaged by frost, but recover quickly. 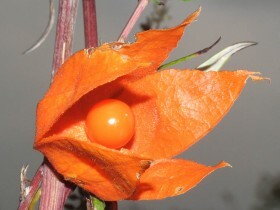 Often on sites it is possible to meet physalis alkekengi. Its roots in a temperate climate is good winter under the snow layer. The fruits of this bitter, they can accumulate toxins. First a delicious fresh and in processed, from large-good jam, semi-sweet candied fruit, pickles. Physalis pubescent or raisin is very sweet, it is most often dried and used in cooking, as a substitute for raisins. Plant low, stems reach 40 cm. In the photo: the fruits of physalis pubescent. 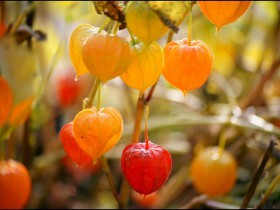 Physalis strawberry got its name due to its characteristic aroma. Annuals with branched stems, the shape of the Bush – creeping. The oval leaves, culture propagated planting in the ground in southern regions and through the seedling in the Northern. Berries – yellow, small, sweet, vitamin. Of them can cook a kind of raisin and jam, before use, the fruits don't require blanching. 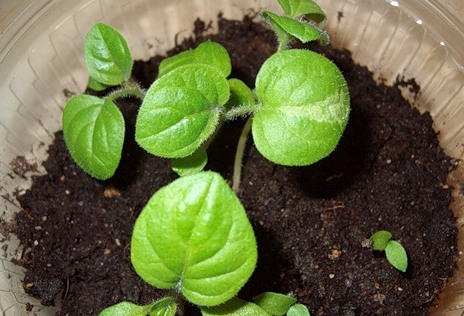 Demanding to heat Peruvian physalis in the southern regions propagated seedling method. The leaves are large, berries small, with the scent of pineapple, there are forms with orange scented. The long growing season allows the fruit to only in the second half of September. Physalis Florida have good taste, sweet notes dominate, the aroma is not pronounced. "Pastry" with green fruits sour taste, which ripen in medium-terms. Physalis alkekengi in the garden. Alkekengi is often called "Chinese lanterns", cups they have red, orange or yellow, decorative vase life lasts for years. Kind of well propagated by dividing the Bush and seeds. Longifolia looks interesting in a single crop, its height can reach two meters, the Bush branched, stems – thick, erect, the flowers are large, with Corolla of blue color. "Lanterns" walnut color, ribs are very visible, colors you can set your watch: they open in 12 and close at 16. 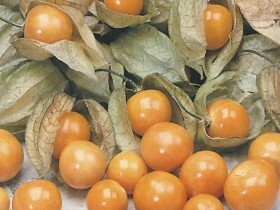 Cape gooseberries are prone to undesirable cross-pollination and contamination of land. It makes more sense to grow only one variety of vegetable or berry of physalis, this is especially true of small plots of land. Traditionally, the culture grown in the open ground, but some species can successfully grow in containers and decorate the greenhouse and the interiors. Garden finalise breed in the summer, use for potted cuttings can be cut in January, by September they will have a harvest. In the pots feels comfortable physalis Peruvian, the fruit tastes like grapes. Care simple, for the normal development requires a constant temperature of 15 to 20 degrees, infrequent, moderate watering, a lot of light. For rooting cuttings, it is sufficient to immerse them into the soil two to three inches. The substrate should contain a lot of humus. Care of cuttings is the maintenance of soil moisture and feeding. Cape gooseberries in the pot. In waterlogged soil fizalisa can be damaged by stalk rot. Excessive dryness and bad, infected "neighbors" on the site threaten aphids. Insect control is by using insecticides. In the case of diseases, you need not rush to chemical methods, it is often enough to adjust the care or to postpone the bushes in more suitable conditions. 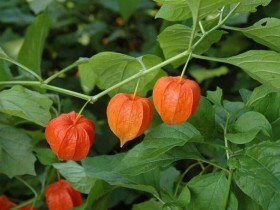 Physalis is an excellent plant for garden plots. It does not require complex care, it allows not only to decorate the garden with bright color accents, but to get a delicious and healthy harvests of fragrant fruit. Bright lanterns physalis on the site. The fruit of physalis in the box. You are here: > Plants > Shrubs > How to grow Cape gooseberries? All content on this site SamDizajner.ru written specifically for Simdesigner, copying 1 in 1 strictly prohibited. 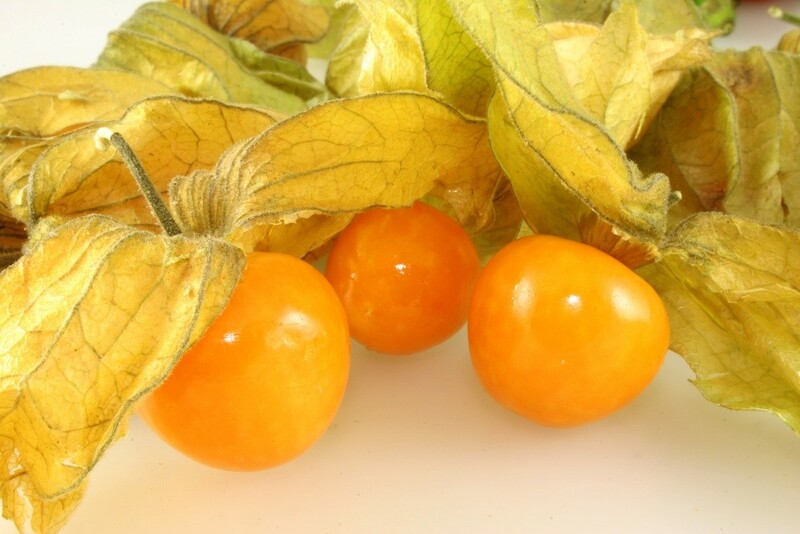 Reprint, full or partial rewriting of the article “How to grow Cape gooseberries?”, possible, only when you specify the full, active link to the source.